The key to winning any casino game is choosing the right strategy. Whether it is a strategy to bet or a strategy to play, the best one is to help you win more money than you lose. Some game strategies however manage to offer a player a 1% edge over the casino like in a game of blackjack. The game of baccarat is one of the casino games that does not provide any winning method that will guarantee edge over the casino. This is due to the fact that baccarat is a game of chance and the only skills required from the player is the knowledge of game odds and probabilities that will influence the result. Therefore this page concerns baccarat strategy of choosing the right bets as the only thing player takes part in is choosing the amount of bet and which hand to bet on. Baccarat is a game of luck mostly. However, there are still some important strategy tips that can influence player odds greatly. 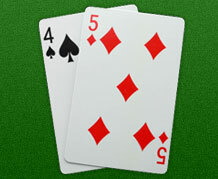 You may find lots of baccarat strategies based on considering cards dealt previously in the game. Indeed, this strategy can be very profitable, but in blackjack only. Baccarat results can not be influenced by anything more than the bet the player makes. This is firstly due to the fact that the cards are most of the time shuffled after each deal. Moreover, the game is hard to predict as the hands change its value as soon as the hand total is over 9 and thus neither player nor the dealer can bust. To win the game you must know the game. There is no doubt that in order to be a winner in any game or any business at all you should know what you are doing. Therefore, learn everything necessary before you play the game. In order to find out you have learned enough, try playing for free at any of our casino baccarat destinations and see how good you are in the game and whether you need to study some more. Moreover, you can go through the rules again and make sure you know all the basics and use all the strategy tips in order to minimize losses. Set a limit for your wins to quit winners. Baccarat is a game that allows you to win nice amount of money in some bets but can make you end up losing everything if you go on playing as the odds favor the house. This is the reason why you should quit the game as soon as you win on one or a couple of bets. Tie bets give 14% edge to the casino. According to baccarat odds, the tie bet gives a casino the advantage of 14.4%. This means that even with a 5% banker's commission, the tie bet is still the worst on the baccarat table. Find out more about the odds in baccarat on the probabilities page. The best game is with the smallest commission. As you know, the banker bet involves 5% banker's commission. If you happen to see a baccarat game with a lower commission, go for it as this way you will increase your gaming odds. The best game is with the smallest number of decks. Just like in blackjack and most other card games, the less number of decks is used in the game, the better the game is for the player. Therefore, search for tables with minimum number of decks. However, make sure the game does not have any extra rules that could influence your odds in the game like other payouts or special rules on ties. Control your wins and loses. There is no gambling game that does not require money management skills and baccarat is not an exception. Therefore, learn all about how to end up a winner and not to lose everything you came with. Go to our money management tips in order to find out more about money management. None of the baccarat strategies can be a 100% winning method. As baccarat is a game of chance and there is no way in beating or cheating online casinos, ignore all the ads and commercials of winning baccarat systems promising you to give a great edge over the casino. There are lots of methods that can be used for varying the bets. Still the best method is to manage the bankroll. However there is no proof these methods work for the baccarat game. Therefore we highly recommend you concentrate on the above mentioned baccarat strategy tips that will definitely help you control your loses.